I missed out on Theme Hospital when it was first released, though I did pick it up when it was released on Origin in 2015. I’d always heard great things about it. As a fan of management sims I was intrigued when its spiritual successor, Two Point Hospital, was announced. And while Bullfrog, the creators of Theme Hospital, are no more (one of the many EA subsidiaries to be dissolved), a few key members of the team started up Two Point Studios. They partnered up with SEGA as a publisher and brought us Two Point Hospital as their first game. And what a debut it has been. Two Point Hospital is a hospital management simulation game. 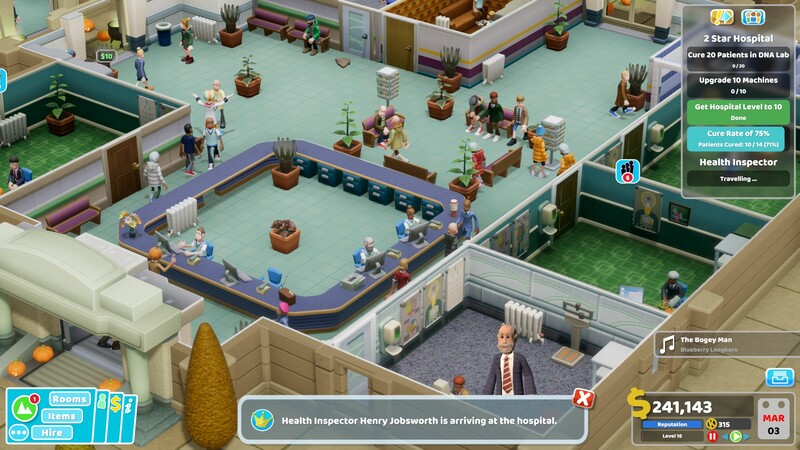 The player is in charge of building and running a successful hospital. This includes hiring staff, building rooms, training, research, monitoring finances and so on. 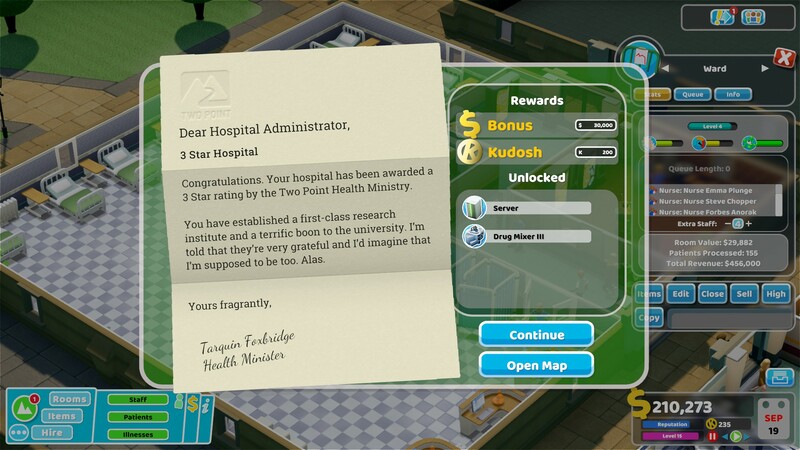 Unlike other recent management sim games (I’m looking at you Jurassic Word Evolution), Two Point Hospital is a proper sim. You can dive right down into all the details you need to see. From clicking on a patient to see what steps have been taking to diagnose and treat them. To opening up the finances and seeing which staff are costing you more money than they are worth. And it does it all with the tongue-in-cheek humour of the original Theme Hospital. All the diseases and treatments available are a play on words. Patients with Light Headedness come in with an actual light bulb for a head. You’ll need to research Chromotheropy for those patients diagnosed with Grey Anatomy. Two Point Hospital also looks great. It has a cartoon style that’s very easy on the eye and matches the humour perfectly. When you complete a room, it pops up into existence, flinging anyone that was standing in the area out of the way. There are a huge amount of items to unlock through the reward points system. Rooms have a prestige level, and the higher the better. So you try to decorate them with as many plants and posters as you can. This is one of the very few issues I have with Two Point Hospital. To achieve a high prestige room, all you need to do is fill it with posters and plants. There are perhaps not enough room specific items for helping raise the prestige of a room. Except for the Psychiatry. There are loads of items for the Psychiatry; Fireplace, Bookcase, Encyclopedias. But the other rooms struggle for variety. Then you take what could be the best tool in the game; the ability to clone rooms. Great for when you need that extra GP office as the queues get too long. However, combined with the lack of flavour items, you can end up with a Hospital that is very repetitive. 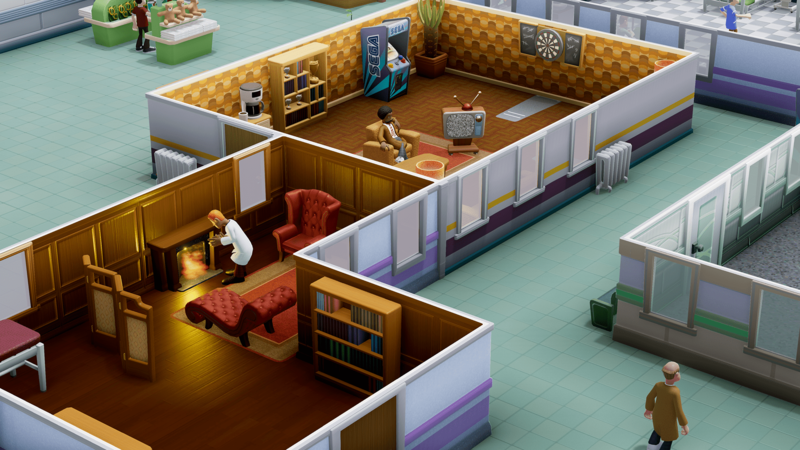 Two Point Hospital is a great game, and a welcome addition to the management sim genre. A real breath of fresh air to cure the pains of some lacklustre attempts recently. What’s more is that Two Point Studio have continued to improve and nurture the game since its release. They changed a few of the models and added some spooky flavour for Halloween. They’ve also recently added a Sandbox mode to the game that the fans were crying out for.